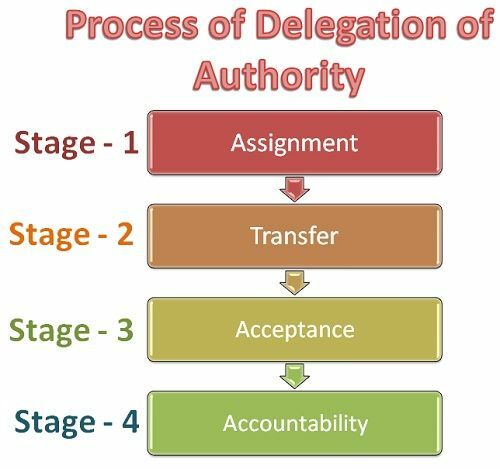 Definition: The Delegation of Authority is a process wherein the manager assigns responsibility to its subordinate along with the certain authority to accomplish the task on the manager’s behalf. Assignment of Duties to Subordinates: Before the actual delegation of authority, the delegator must decide on the duties which he wants the subordinate or the group of subordinates to perform. Here, the manager lists the activities to be performed along with the targets to be achieved, and the same is spelled out to the subordinates. Thus, in the first stage, the duties are assigned to the subordinates as per their job roles. Transfer of Authority to perform the duty: At this stage, an adequate authority is delegated to the subordinate which is essential to perform the duty assigned to him. A manager must make sure; that authority is strictly delegated just to perform the responsibility, as more authority may lead to its misuse by the subordinate. Acceptance of the Assignment: At this stage, the subordinate either accepts or rejects the tasks assigned to him by his superior. If the subordinate or the delegate, refuses to accept the duty and the authority to perform it, then the manager looks for the other person who is capable of and is willing to undertake the assignment. Once the assignment gets accepted by the subordinate, the delegation process reaches its last stage. Accountability: The process of delegation of authority ends at the creation of an obligation on the part of the subordinate to perform his responsibility within the powers assigned to him. Once the assignment is accepted by the subordinate, then he becomes responsible for the completion of the duty and is accountable to the superior for his performance. Thus, the process of delegation of authority begins with the duties assigned to the subordinates and ends when the subordinate is obliged to carry out the operations as intended.